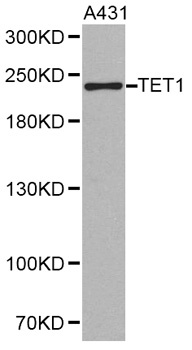 WB analysis of DNMT1 Monoclonal Antibody (A-1001, 1:1000) with use of Hela cell extracts. DNA Methylation at cytosine residues has a role in regulation of gene expression, genomic imprinting and is vital for mammalian growth. Hypermethylation of CpGisland in tumor repressor genes or hpyomethylaiton of mass genomic DNA has been linked to cancer development. Three families of DNMT genes are known which include DNMT1, DNMT2 and DNMT3. 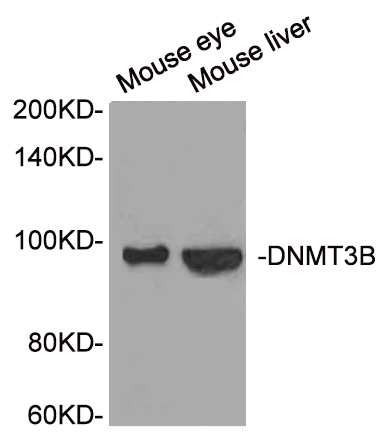 DNMT1 is constitutively expressed in proliferating cells and inactivation of this gene causes global demethylation of genomic DNA and embryonic death. DNMT1 also cooperates with Rb to repress transcription from promoters containing E2F-binding sites indicating a link between DNA methylation, histone deacetylase and sequence-specific DNA binding activity, as well as a growth-regulatory pathway which is abnormal in nearly all cancer cells. Shipped at 4°C. Aliquot store at -20°C. Avoid repeated freeze/thaw cycles. Kinner-Bibeau LB et. al. (May 2017). HSPs drive dichotomous T-cell immune responses via DNA methylome remodelling in antigen presenting cells. Nat Commun. 8:15648. Chinaranagari S et. al. (August 2014). EZH2 dependent H3K27me3 is involved in epigenetic silencing of ID4 in prostate cancer. Oncotarget. 5(16):7172-82. Cheetham S et. al. (June 2008). SPARC promoter hypermethylation in colorectal cancers can be reversed by 5-Aza-2'deoxycytidine to increase SPARC expression and improve therapy response. Br J Cancer. 98(11):1810-9.